During her packed schedule, she savoured the acclaimed Ethiopian coffee, signed deals aimed at women empowerment – the main purpose of the trip – paid tribute to victims of Boeing 737 MAX accident. She also had meetings with the President, Sahle-Work Zewde, and Prime Minister Abiy Ahmed as well as the deputy chairperson of the African Union Commission. 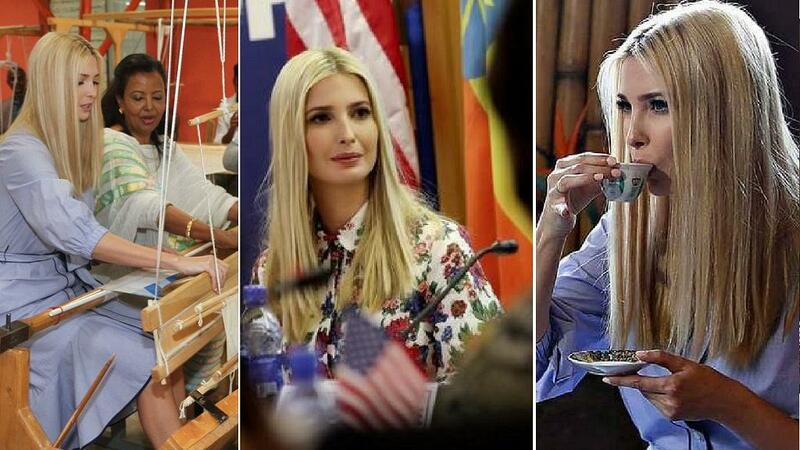 Soon on arrival and holding talks with the US ambassador and other embassy officials, Ivanka set out to work, meeting Ethiopian Women in Coffee Association (EWIC). Describing them as inspiring female entrepreneurs she noted that with US development agency, USAID, support, they were overcoming a lack of access to capital and growing their businesses. Ivanka also visited Muya Ethiopia, an outfit that engages in the production of traditional fabrics. The OPIC, a US government agency that helps businesses enter emerging markets, signed a deal with Muya. Prime Minister Abiy Ahmed’s office said they discussed issues of mutual interest. ‘Ms. Trump is in Ethiopia as part of the Women’s Global Development & Prosperity initiative aimed at advancing global women’s economic empowerment,’ the PM’s office said in a statement. Before meeting Abiy, Ivanka had held talks with President Sahle-Work Zewde. State-run FBC said Ivanka spoke about the White House Women Empowerment drive she was leading, whilst the president also highlighted Ethiopia’s efforts at empowering women across the board. She then met with the AUC deputy chair and other commissioners for deliberations aimed at economic empowerment of women across Africa. During the meeting at UNECA, Ivanka announced the launch of 2X Africa, under which OPIC was to directly invest $350 million to mobilise $1bn aimed at women empowerment efforts in sub-Saharan Africa. The embassy added that, ‘Ms. Trump announced a new W-GDP award to expand the Muya business with the signing of a letter of interest for financing between Muya and OPIC.’ They, however, did not indicate how much the deal will be worth. ‘In the morning of April 15, Ivanka along with USAID Administrator Mark Green and Acting OPIC President and CEO Dave Bohigian paid respects to the victims of Ethiopian Airlines 302 crash at the Holy Trinity Church in Addis Ababa. ‘She met with religious leaders representing the diverse faiths of those who perished in the crash, laid a wreath, and observed a moment of silence,’ the embassy said in a statement. Her final meeting was with Lucy. She is a 3.2 million-year-old member of Australopithecus afarensis and the most complete skeleton of an early human ancestor ever discovered. State media FBC showed Ivanka taking a careful look at the remains of Lucy which are stored in the National Palace in Addis Ababa. Four years ago, then US president Barack Obama also ‘interfaced’ with Lucy during his historic visit to Ethiopia. Her remains were found in Ethiopia in 1974. The final leg of her trip is Cote d’Ivoire, where she will promote female entrepreneurs in the country’s cocoa industry.